So is Michelle going to stop attending her concerts? Superduperstar Beyonce, who is a member of a mutual admiration society that includes her and the first lady and who is a spokeswoman for Michelle’s “Let Move” healthy kids campaign, has a $50 million deal to sell those very same kids Pepsi-Cola. Now, what could better for kids than carbonated sugar water laced with caffeine? But if Mrs. Obama is even thinking of distancing herself from Beyonce – she’s not, but just play along – it won’t be so easy. Michelle has said if she could be another person, it would be Beyonce. This summer, she jetted off to Atlantic City to take in one of her shows. Beyonce and her husband Jay-Z famously got a tour of the Situation Room, no doubt hoping to be able to use it in case Kim Kardashian attempts to take over the world. And Beyonce repays the love, holding a $4 million fundraiser for Obama at Jay-Z’s 40/40 Club in September and doing this for Let’s Move. 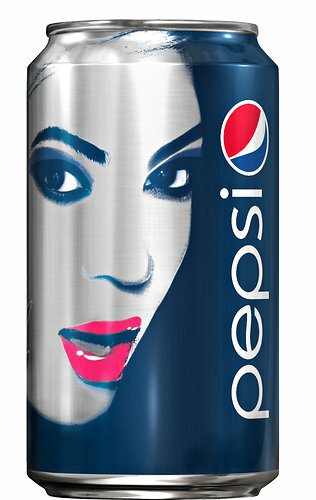 Pepsi is promoting Beyonce’s next album and sponsoring her upcoming halftime Super Bowl show, while she will appear in soda commercials and her image will be on cans and life-size cardboard cutouts in stores. “Pepsi embraces creativity and understands that artists evolve,” Beyonce said, explaining her alliance with the sugar water people. Yes, that would be $50 million worth of empathy for the creative arts. If Mrs. Obama is serious about slimming kids down, she should rebuke Ms. Knowles and make clear to kids that it was a mistake to include her in the Let’s Move program, and that this is the wrong kind of role model for children hoping not to spend their lives battling to stay away from sweets. Maybe all of the caffeine and sugar in Pepsi will get those lazy kids of their @-! * and ‘Move’. America doesn’t have a weight problem. We have an intelligence problem. We are doing everything possible to dumb ourselves and our children down and the media (of which I’m a member as I’m reminded daily) is it’s greatest enabler. Maybe you should try to bring this “hypocrisy” up at the next ‘press brief’. -LMAO! Never gonna happen, Keith. Beyonce is on this list of loyalists who can do no wrong. Don’t forget Mooch wants to be Beyonce, and Preezy Revenge said she’s a wonderful role model for his children. This is the same lady who took a bunch of money from Ghadaffi to go dance and sing in front of him. No Pepsi product shall land in my grocery cart again. I think this is a case of do as I say, not as I do. Darest thou to question the decisions of thy rulers and those upon whom they choosest to confer nobility? How dare thee! Why complain? The American people voted for the sanction of everything Obama, the media’s control your children, and Socialism with a captial S is in process. U R in for the denigration of America by the powers that be, and all who voted for it will suffer without remedy. President and Michelle doing talk shows like celebrities. Passed no laws, except the ones used to change the constitution; Changing America into a police state. Farewell sweet America. I am glad to be a Baby boomer. At least I got to see this nation in her Hayday. Over now. Thank God I have heaven to look forward to. This has become the Pit of Hell. Well that can’t be true cause that would make Michelle a hypocrite. When you reject the sanction of the Almighty, you loose. You just don’t know it yet! He is long suffering. He gives his opposers enough rope the hang themselves. Waiting to make his truths known is the best revenge. Time will show you that you lost in the worst way. REmember the Titanic. Take no heed of truth presented, suffer the consequences. YOu will see and tear will be your food. By the way, I am an informed Black woman. Pepsi for me, no-fat skimmed milk for thee. $50million for me, food stamps for thee. Front of the line for me, take a number for thee. Michelle wants to be me, no one wants to be you. After some thought, I would be willing to endorse distilled pond scum water for $50million. Or, skunk spray parfum. Hell, $50M, I’d have voted for Barry Obama…here in CA, my vote is for naught. It’s not even Diet Pepsi. What a mistake to put her face on the cans! The Obama narcissism must be contagious. I don’t want her, Beyonce, Bloomberg or anyone deciding my drink order. America’s greatest export is now Diabetes. And Diabetes is apparently cool. Oh, to be one of the beautiful people! We can all dream what it is like to be so special as we gaze up in awe and admiration to the Royals. I even pretend my gruel is warm and flavorful sometimes, too! Birds of a feather still flock togeher. Eternal darkness once entered, shall never be escaped!!!!! Pepsi? Give me Coke or give me Keystone but Pepsi? Really. Losers….. Diet Pepsi is actually good–wait, my brain tumor made me say that. Soda for me but not for thee! I wonder if certain members of the classy Obama entourage are members of the Pepsi Generation. LOL! Aren’t you just awe of all their awesomeness? Gotta recruit some UK papparazzi to get a shot Mrs. Obama in a bathing suit, now there’s your money shot ! I’m all for protecting the privacy of the children, but com’on, I feel we paid handsomely for these photos of “just walking on the beach”. Sugar water — very funny. I love Pepsi’s SoBe products. But back to Beyonce. If MO and BHO like you, it’s “okay” for you to make a profit and to be a hypocrite. However, if Madame and Chairman O don’t like you or what you stand for (free markets, capitalism –that is the non-crony kind) then you are demonized. Doesn’t hinge on reason, just whether or not they like you. So, applying that here — they like Beyonce…and thus, have no problem with the sugar-water deal. Hippo-crites — Beyonce and Michelle I’m referring to here. Way previous to the Pepsi endorsement — I took one look at this woman: the way she dresses and dances. Oh No! Not for kids indeed. Then she married the thug Jay Zee — double Oh NO! Then, they name their baby Blue Ivy — Triple Oh NO! Thank God I can use the eyes He gave me to see. Refusal to print the truth will make no headways with the Almighty. I already know you control everything we do. Guess what? God sees you the same way. YOur days are numbered. Heaven is for the Children of God,which does not include you heathens. Farewell.